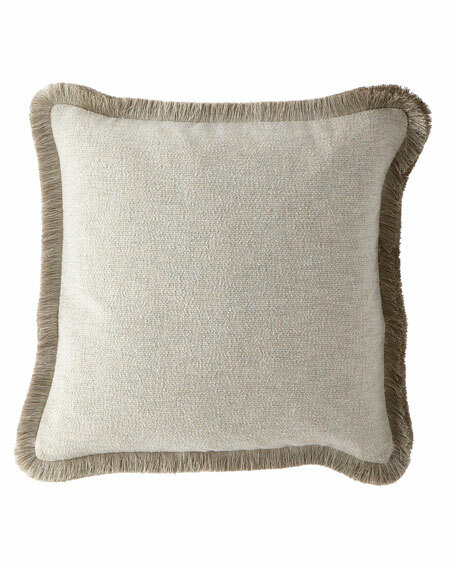 Tweed sham with brush fringe edge. Sham with geometric pattern. Jacquard woven face. 200-thread count cotton reverse. 26"Sq. Spot clean. Imported. Damask center; ruched silk insets; beaded tassel trim; corded scalloped edge. Polyester/cotton/rayon/silk front. Cotton/polyester back. 19" x 25". Dry clean. Damask center; ruched silk insets; beaded tassel trim; corded scalloped edge. Polyester/cotton/rayon/silk front. Cotton/polyester back. 19" x 25". Dry clean. Made in the USA of imported materials. Pieced damask sham with velvet insets and braid accents. Finished with twisted cording. Polyester/viscose/rayon/silk front; cotton/polyester back. 19" x 25". Pieced damask sham with velvet insets and braid accents. Finished with twisted cording. Polyester/viscose/rayon/silk front; cotton/polyester back. 19" x 25". Dry clean. Made in the USA of imported materials. Sham with embroidered border detail. 600-thread count Egyptian cotton. Self flange. Sold as a pair. Machine wash. 20" x 26". Sham with embroidered border detail. 600-thread count Egyptian cotton. Self flange. Sold as a pair. Machine wash. 20" x 26". Made in Italy.